The 2018 Outdoor Channel Gear Up & Go Sweepstakes is here. 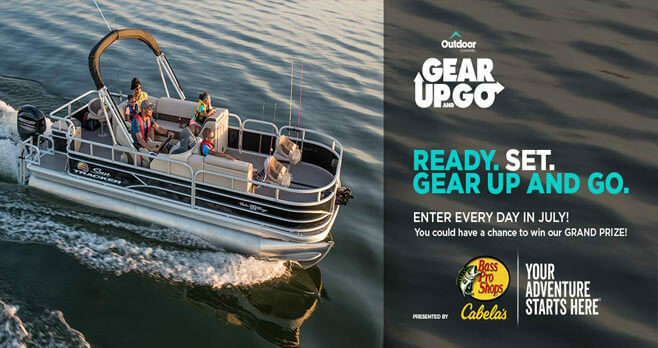 This year, visit either outdoorchannel.com/gearupandgo or gearupandgo.outdoorchannel.com and enter every day in July for your chance to win a Sun Tracker Fishin’ Barge 20 plus a Tandem Axel Trailer. Ends: Ends at 11:59:59 PM ET on July 31, 2018. Prize: The grand prize winner will receive a 2018 Sun Tracker Fishin’ Barge 20 with 60 ELPT FourStroke Command Thrust and a 2018 Tandem Axel Trailer with 1 Break. Eligibility: The 2018 Outdoor Channel Gear Up & Go Sweepstakes is open only to legal residents of the U.S., who are 18 years of age or older as of July 1, 2018. When My email in the set says I already entered.Not resetting.